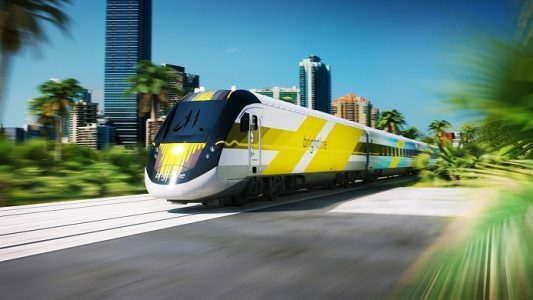 The intercity train that is expected to begin shuttling passengers between Orlando, West Palm Beach, Fort Lauderdale and Miami in 2017 now has a name: Brightline. The 235-mile line will be the first privately constructed rail service to open in the United States since 1956. All Aboard Florida, which is building the rail service, has a goal of redefining the passenger train experience in the United States. The two-class trains will feature free WiFi, all reserved seating, power outlets available from every seat and wide aisles. Pet-friendly trains will also be offered. So will bicycle and luggage storage. All Aboard Florida projects a mid-2017 opening for stations in Miami, Fort Lauderdale and West Palm Beach. The fourth stop, at Orlando International Airport, is targeted for a late 2017 opening. Brightline trains will make the three-hour trip 16 times per day in each direction. To read the entire article at Travel Weekly, click here.